According to Paris-trained chef Jim Drohman, French cooking isn’t hard to do in an American home. All you need is nutmeg, good cheese, and a lot of cream. Jim Drohman’s French cuisine isn’t snooty or dainty. In fact, he’s behind one of the biggest meat dishes in Seattle: Café Presse’s whole roasted chicken for two, which weighs in at a whopping 3.2 pounds. Café Presse (1117 12th Ave.) is one of two French eateries that Jim owns with his business partner, Joanne Herron. The Parisian plates there contrast with the countryside classics (rabbit liver terrine, anyone?) at Downtown’s Le Pichet (1933 1st Ave.). And before he was managing double kitchens, Jim trained at the Ecole Supérieure de Cuisine Française Jean Ferrandi in Paris. He says that you don’t need a degree from abroad to cook the French way, though. The original French chefs were women cooking at home, and the whole culinary system is rooted in the “grandmotherly techniques of the countryside.” In other words, techniques accessible to those of us who don’t own gratin dishes. To prove his point, Jim told us how to Frenchify three American classics—mashed potatoes, roast chicken, and mac ‘n’ cheese—from the comfort of your own counter. MASHED POTATOES The American way: Boil peeled potatoes until they’re soft, then mash them up with milk, butter, and all the salt you own. Instant mashed potatoes are also extremely American. The easy way to Frenchify it: “Replace the milk with cream…heated until just warm,” Jim says. Replace your normal butter with “a big lump of unsalted butter,” and add some grated nutmeg and pepper to your salt. Potato-wise, he recommends russets (they’re what his mom would use). The less easy way to Frenchify it: Make what Jim calls “the most decadent purée de pommes de terre ever.” Start by gently simmering peeled yellow fingerling potatoes (“in France, the best variety are called rattes,”) in salted water until they’re soft. Drain them. Then, spread them on a sheet pan and dry them in an oven set to medium for about five minutes. “Removing the [excess] water allows the potatoes to take on more butter and cream,” Jim says. To finish it off, purée the ultra-soft potatoes by running them through a sieve, and add unsalted butter and heated cream until the mixture is very smooth. Season with salt and pepper. ROAST CHICKEN The American way: Buy a rotisserie chicken at the grocery store, then say you roasted it yourself. The easy way to Frenchify it: Truss the chicken with string (see Martha Stewart’s how-to here), baste it with butter, and season it with sea salt and fresh ground pepper. Then, throw it in a pan and roast it in the oven for about an hour—Jim recommends setting the temperature at 450 degrees. While it’s cooking, periodically baste it with more butter. It’s done when it’s hot in the deepest part of its thigh. According to the health department, “hot” means 165 degrees, but…“I can tell you that if the thigh is 165 the breast will be a bit dry,” Jim says. “However, far be it from me to contradict the health department.” The (way) less easy way to Frenchify it: This way requires an open fire, black truffle slices, and goose liver, so you probably shouldn’t try it at home unless you’re a professional chef and a firefighter. It was a specialty when Jim was working at Le Coq de la Maison Blanche, a third-generation, family-run auberge in Paris: chicken roasted on a spit on the dining room’s huge hearth. First, they stuffed the chicken. Herbs and black truffle slices went under the skin, and a mix of bread, chestnuts, and goose liver went into the body cavity. Next, they roasted it “until the stuffing was hot and the skin of the bird was crispy and golden.” MAC ‘N’ CHEESE The American way: Buy a box of mac ‘n’ cheese, and do what the box says. The really easy way to Frenchify it: Refer to your mac ‘n’ cheese as “Gratin de Macaroni.” The easy way to Frenchify it: Make a mornay sauce. That’s béchamel sauce (try Mario Batali’s recipe here), but flavored with grated gruyère, a bit of cayenne, and some fresh grated nutmeg. Boil up some pasta and drain it well. ”I like to use ziti pasta tubes,” Jim says, “which are similar to the macaroni used in France.” Toss the pasta in the sauce until it’s coated generously, then put it in a buttered baking dish, top it with more grated cheese, and heat it in the oven (set to medium) until it gets bubbly. 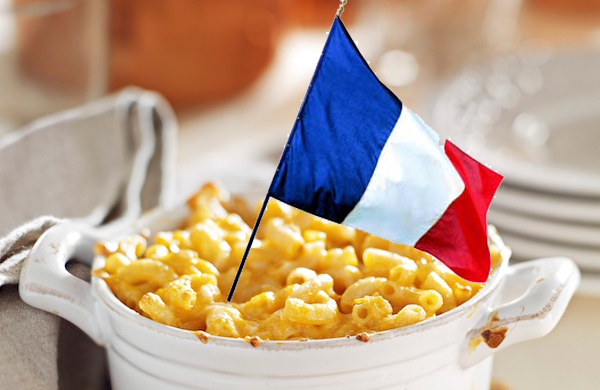 The less easy way to Frenchify it: This is Jim’s favorite way to make mac ‘n’ cheese, because it “honors the dish’s roots in the Savoie region in the French Alps.” That’s how you know it’s fancy. Bring a half-and-half mix of good chicken stock and whole milk to a simmer. Add a splash of white wine, and season with salt, pepper, and nutmeg. Boil your macaroni in this instead of water, and when you drain the pasta, save the liquid. Thicken it with beurre manié—a half-and-half mix of soft butter and white flour kneaded together sans heat. This is your sauce. Toss the hot pasta with diced reblochon cheese, ham, and spinach leaves. Then, coat it in the sauce, put it in a gratin dish (or a regular dish), and top it with bread crumbs. Bake it until it’s golden brown.